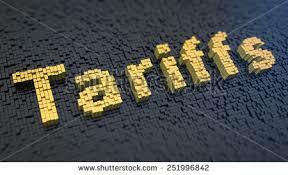 Tariffs are essentially a tax on imports or exports between nations. Their goal is to protect manufacturing and that’s more than timely as America no longer manufactures what it did in the times before such free-trade agreements as NAFTA. Those who champion free trade argue that it has lifted hundreds of millions out of poverty and they are right. One need only glance in the direction of China, whose growth has maintained a remarkable 8% rate over decades, creating a viable Chinese middle class. But the cost of that has come at the decline of our own middle class, as we subtly transferred our economic activity from producers to consumers. Televisions, automobiles, washers, dryers, computers and toasters may all be improved and technically perfected, perhaps even invented in America, but they are uniformly produced elsewhere. The most inventive and creative society on the face of the earth off-shored its manufacture, essentially trading its profit base for consumer markup. We Americans Wal-Marted ourselves into a race to the bottom, touting cheap imports and congratulating ourselves all the way to the poor-house. It’s a chimera, a grotesque product of the imagination to watch our industries flush themselves down the toilet while jobs are lost, boom-towns become derelict and decades (even centuries) of prosperity become a mere footnote, a sad history. The cost to the American Dream, if that dream is to flourish rather than wither, is simply not payable. Nor, I will argue, is it equitable to emerging economies. The clincher to this argument, if such a thing can be fairly argued, is that we have done a great service to the poor of this world and it’s now time to turn the prosperity project over to others. I therefore nominate China. China, the world’s most populous nation, has built itself a solid middle class and I congratulate them for it. But there is a responsibility that comes along with that economic miracle. That responsibility is to grow up and carry the torch we lit for them with our free-trade policies. China has a solid, consumer-ready middle class of 600,000 citizens. America has a population of 323 million, half of whom consider themselves middle class. That’s 160 million against China’s 600 million and it doesn’t take a mathematician to see that their number is close to four times ours. Why do you think American business is so eager to participate in their economy? Yet along with that growth in consumers, China is slowly being undercut in the world labor market by poorer countries. And that’s a good thing. That’s key to my argument and the natural and irresistible way for the world to lift itself out of poverty. Nations become rich and become consumers, just as we have. Poorer nations become rich supporting those new consumers and the cycle repeats. It’s both logical and sustainable. More than that, it’s China’s turn at the wheel. A gradual return to targeted tariffs will not take us back to storied and long-gone times. Everyone with a brain realizes that turning back clocks has never worked. But basic economic strategies are not at all out of date and America, no matter its deficit in middle class numbers, is still the largest consumer nation on earth. More than that, it’s America’s turn at that wheel. Once emerging economies realize that growth through low labor costs comes first, logically followed by growth through catering to their own internal markets with tariffs, we will have proven a sustainable cycle that truly does lift all boats. America cannot lift the entire world without destroying itself. Gradual tariffs will close the circle of sustainability and leave a template for others to follow. Over time, China will hand off the baton to India in a race to the top rather than an inevitable spiral to the bottom. That metaphoric baton will continue to be handed off from nation to nation. Anything less will simply continue to exploit the world's currently poor nations. Trickle-down was a failed and fraudulent theory. We owe it to our inheritors to reverse the gravity and trickle-up.